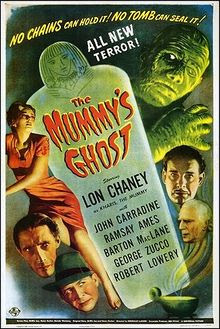 The next to last film in the clssic Universal Mummy series until Abbott and Costello took a crack at it is a fine little film which ties into the previous 2 films but not the original film with Boris Karloff. The plot of the film has Kharis resurrected once more and chasing after the spirit of the long dead woman he loved. This time it's in the body of an Egyptian co-ed. Moving along at a good clip it helps to to see this film, as with the previous 3 films, with some distance between them. Inconsistencies are rampant in the series as if you count the years between when the entries are suppose to take place you realize they couldn't be the year between each film's release but whole decades. Worse the setting of the films all look the same (much like the plots). Problems aside this is a nifty little thriller . While never scary or truly tense the film holds your attention as is moves like an amusement park ride from start to finish.